JDK 6 or later is supported. Oracle Express Edition is not supported. Oracle 11gR1 users have to apply the fix for Oracle bug 7713193. For Windows 32-bit, the fix is currently available in patch 8260294. A single patch is also available for Linux x86_64 (for example: http://updates.oracle.com/download/7713193.html). These patches require Oracle Server to be already at patch-level 11.1.0.7.0. Before you begin installing JChem Cartridge, read the Introduction and the High Level Overview of the JChem Cartridge architecture. If you encounter any problem during installation, do not hesitate to post an enquiry on our technical support forum or contact our technical support for assistance. Set the JAVA_HOME environment variable Set the environment variable JAVA_HOME to the home directory of a Oracle Java Development Kit version 1.6 or newer. Download the installation package Download the JChem Cartridge installation package and unpack into a permanent location (such as /opt/chemaxon/jchem-cartridge on Unix/Linux or C:\ChemAxon\JChem-Cartridge on Windows), because its files will not be used exclusively during the installation process of JChem Cartridge, but they will also back the operation of the JChem Cartridge server (associated with the JChem Cartridge instance to be installed). The location of the uncompressed package will be the location of the JChem Server. (Advanced use) Have your DBA set up schema and role For Data Vault users and for organizations where the roles of the DBA and the application administrator are strictly separated. Some of the installation steps which are executed by the JChem Cartridge installation application by default, may need to be executed manually. Here you find an example of the installation steps to be executed when the roles of the DBA and the application administrator are strictly separated. The options which are not specified on the command line will be prompted for interactively. Copy license file(s) to the machine that will be used as JChem Server After the installation of JChem Cartridge is completed, the license file(s) should be copied into a dedicated directory. Host name, port, and maximum allocated memory of the JChem Server. Note : localhost as host name can only be applied if Oracle JChem Cartridge and JChem Server will be located on the same host. Name for JChemServer as an operating system service (optional). Start a command interpreter Start the command interpreter available on your platform (console/terminal on Unix/Linux, Command Prompt on Windows) and make the cartridge directory your current working directory. Windows users should note that creating a Windows Service requires Administrator (or equivalent) privileges; therefore, they will need a Command Prompt with Administrator privileges. Note also that with recent Windows Servers, the Command Prompt program started by Administrators will not be running with full Administrator privileges by default. Start the installer Start the install.sh shell script or install.bat batch file. If you answer a prompt for a property with a question mark (? ), a more detailed description of the property will be displayed. The connection to the database can be given mutiple ways. If you choose Sid connection type, you will be asked for host, port and Oracle sid to identify the connection. If you choose Service name connection type, you will be asked for host, port and the service name to identify the connection. If you choose Url connection type, you can enter the whole connection string of the connection. When prompted for the DBA login, enter an exclamation mark (! ), if you don't want the installer program to use DBA account. See this pre-installation task for steps required before installation in such cases. Installation using non-DBA account is not recommended, please, apply it only in compulsory cases. After all required input has been provided, you will be asked to confirm them and only after your confirmation will the database and configuration files be changed. On Windows, you will be asked whether you want to install JChemServer as an operating system service, and if you answer y, you will be prompted for the name of the service. Download the configuration file . The figure below displays the simplified schematic architecture and operation of single JChem Server with RAC system. The Load Balancer distributes the jobs between JChem Cartridge instances, while each JChem Cartridge instance communicates with the same JChem Server. Each JChem Cartridge instance and the JChem Server are located on different hosts. the JChem Server running on a host "outside" the RAC and connecting to the RAC's nodes using their public virtual IP addresses. Installation is similar to installing JChem Server and Oracle on two different hosts. We recommend using url connection type and entering the full connection string. It can be changed later if necessary. a clustered service called mydb Assume that JChem Server will be hosted by a computer called shiraz. Make sure the JAVA_HOME environment variable points to a Oracle Java Development Kit 1.6 or later on shiraz. Enter url, when prompted for Type of the connection. Enter jdbc:oracle:thin:@10.0.0.81:1521/mydb0 or jdbc:oracle:thin:@10.0.0.83:1521/mydb1, when prompted for Name of the Oracle database (url). Enter shiraz, when prompted for The host name of the JChem Server. 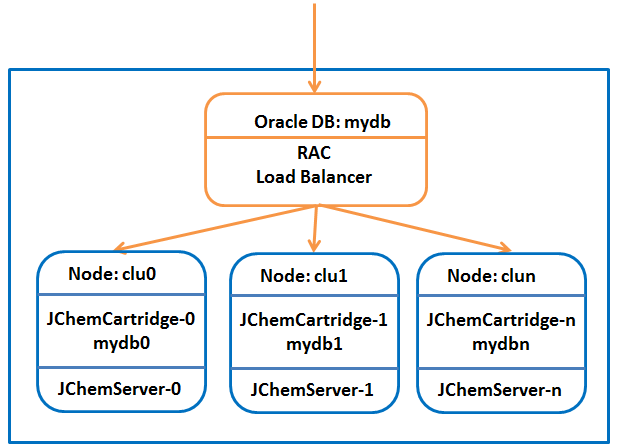 The figure below displays the simplified schematic architecture and operation of multiple JChem Server with RAC system. The Load Balancer distributes the jobs between JChem Cartridge instances, while each JChem Cartridge instance communicates only with that JChem Server which is located on same host where the JChem Cartridge instance is. The JChem Cartridge instances are located on different hosts. Oracle 10.2.0.4 Installation is similar to installing JChem Server and Oracle on one host. We recommend using url connection type and entering the full connection string. It can be changed later if necessary. a clustered service called mydb On each node there must be JChem Server installed applying localhost as host name of JChem Server. Make sure the JAVA_HOME environment variable points to a Oracle Java Development Kit 1.6 or later on clu0 and on clu1. Enter jdbc:oracle:thin:@localhost:1521/mydb0 on clu0, and jdbc:oracle:thin:@localhost:1521/mydb1 on clu1, when prompted for Name of the Oracle database (url). Enter localhost, when prompted for The host name of the JChem Server. See our FAQ comment regarding the outage of a JChem Server. The preferred way to start and stop JChem Server is through the system service facility provided on the host operating system. On Windows, a service for JChem Cartridge is created during installation. Linux/Unix users may do it manually after installation. will result in purging of the connection caches in JChem Server so that new connections will be opened by JChem Server on the next JChem Cartridge operations (without having to re-execute jchem_core_pkg.use_password for the users ). For best performance, the amount of free physical memory on the JChemServer host should be large enough to accommodate the Java heap memory. the objects associated with individual (concurrent) searches and other user operations (such as indexing). The rule of thumb is that the structure cache needs about 130 MB of memory for 1 million molecular structures with 512 bit fingerprint length. The longer the fingerprint length, the larger the required memory is. (For a detailed description of how to calculate an estimation of the memory requirement of the search cache, see the FAQ. The Structure Cache will not use the entire Java heap size. It will try to reserve the amount of memory specified by the value (in megabytes) of the reservedMemory property set in the jchem/cartridge/conf/jcart.properties file. The memory overhead for each concurrent search is about 1.7MB per 100k hits. For example: if a particular JChem Cartridge installation is supposed to support 10 truly concurrent searches returning each (at the same time) a maximum of 1 million hits, JChem Server needs 170MB memory in addition to what is required for the structure cache. A difficult to quantify component which basically reflects the usage pattern of JChem Cartridge observable at the specific site. Still, assuming that user activity is evenly spread over time, it can be typically regarded fairly constant. A good initial value could be 200MB. It can be further adjusted depending on the number of concurrent users, the type of operations they do and the kind of (input) structures they operate on. Although not always effective (and therefore not strictly necessary), it is a good practice to specify the total expected amount of the operation-dependent memory (in megabytes) through the reservedMemory property in the jchem/cartridge/conf/jcart.properties file. The Java runtime process - in which JChem Cartridge Server program is executed - works with a memory overhead of about 12.5% over the JChem Cartridge server's calculated total memory requirement. This means that the JChem Cartridge server's calculated total memory requirement has to be multiplied by 1.125 to obtain the value for the jcserver.maxmem property in jchem/cartridge/conf/jcart.properties. This property is used to set the maximum heap space of the JVM process. Make sure the letter m or M is appended to the value to denote the megabyte measurement unit. A restart of the JChem Cartridge server is required for the new value to take effect. the general memory overhead of the JChem Cartridge server application at 200 megabyte which gives 2 gigabyte memory required by the application, which gives a memory requirement of roughly 2.25 gigabyte by the Java runtime (2*1.125). The jcserver.maxmem property in jchem/cartridge/conf/jcart.properties must therefore be set to 2.25m. Marvin Services are available in e tJChem Cartridge through the jc_evaluate and jc_evaluate_x operators as well as their corresponding functions in the JCF package (and the equivalent functions in the JCF package). Marvin Services can be globally configured by setting the marvin.services.config.file property in the jchem/cartridge/conf/jcart.properties file to the path of the corresponding configuration file. Java VM vendor: Sun Microsystems Inc. The license file(s) received from ChemAxon's Sales should be dropped into the directory licenses under cartridge directory (the working directory of the JChem Server). If you want JChem Server to retrieve the license files from a different directory (e.g. because multiple applications or hosts share a common license "repository"), set the license.dir property in the jcart.properties file to the path of that directory. If your licenses are stored in multiple license files (i.e. you receive an additional license file from ChemAxon Sales with, for example, a renewed license or an evaluation license for an additional feature), you have to drop all license files into the licenses directory (wherever it is configured to be in the conf/jcart.properties file). This means that you may have to store them under different name – for example as license0.cxl, license1.cxl, license2.cxl, etc. – to avoid overwriting each other. There should be only one entry for any licensed feature in the license files. For example, if you receive a license file with a renewed license, remove the entry for the corresponding expired license from the old license file, so that only the renewed, valid license entry is found for the given feature in the files. On October 1st, 2008, the old license files (issued for JChem versions prior to 5.0.0) will become unusable with releases JChem 5.0.0 and above. In case you have such files, you need to request ChemAxon Sales to re-issue the licenses in the new, XML-based format. It is recommended that the Oracle user created during JChem Cartridge installation is exlusively dedicated to owning the core database objects of JChem Cartridge (e.g. jchem_core_pkg ), so that these objects are cleanly separated from users' objects. Users need to have appropriate system and object privileges as well as synonyms in order to successfully use JChem Cartridge. those who use jc_idxtype indexes owned by a different user. Users of both categories need a basic set of privileges in order to execute JChem Cartridge functions and operators. In addition to this basic set of privileges, users of the second category also need privileges on the objects associated with the index not owned by them. The following figure shows the various groups of privileges. Certain privileges or roles (such as CONNECT, RESOURCE) must be granted directly to users. Other privileges may be granted both directly and indirectly through roles which already have been granted the necessary privileges. (The benefit of roles is obvious with a large number of users.) 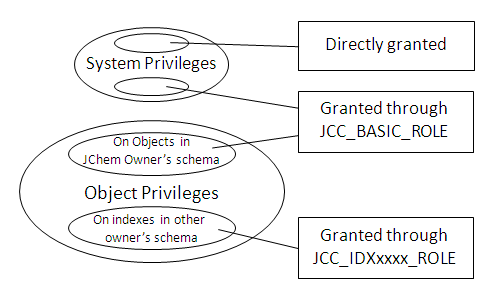 One single role is sufficient for the basic privileges that all users must have (represented by the JCC_BASIC_ROLE role on the figure). In addition to the basic role, zero or more futher roles are required for members of the second user category depending on how many groups of such users there are in your organization or project. Each group of secondary users will need a set of extra privileges (specific to the given group) corresponding to the set of not-owned indexes which members of the group need to access. The roles for these groups of "secondary" users are represented by the JCC_IDXxxxx_ROLE role. A user initiating an operation on structure tables and domain indexes must be able to access them via the JDBC connection(s) opened in the JChem Server for use by the fingerprint caching engine. The recommended way to achieve this is for users to call the PL/SQL procedure jchem_core_pkg.use_password(password VARCHAR2) with their password as the parameter at the beginning of each database session (see a brief description of the mechanism at work here). The function jchem_core_pkg.set_password(password VARCHAR2) has a similar effect; it returns 0, if the password is valid for the user, -1 otherwise. The two-argument variant of jchem_core_pkg.use_password(login VARCHAR2, password VARCHAR2) can be used to instruct JChem Server to use a different identity to connect back to Oracle – different from the real user. This may be useful in the case when a non-definer is transferred the privileges of the stored procedure definer when the stored procedure code is executed. This method can't be used if JChem Cartridge is installed on RAC with multiple JChem Servers. The reason for this is that use_password must be called on all JChem Servers, which can't be guaranteed, because the current JChem Server instance, which the use_password call runs on, is decided by a load balancer. A workaround for this issue is that after starting or restarting the JChem Servers, the users have to log in to each RAC node (and not the whole RAC service) and run the use_password call on them. After doing this step, they can log on to the RAC service and use JChem Cartridge as the user credentials are set. If the password of a given user has not been set for the JChem Server via the use_password PL/SQL procedure, the *oracle.server.login * and *oracle.server.password * properties in the jchem/cartridge/conf/jcart.properties file will be used to open database connections in JChem Server. If the use of parent sessions' identities is combined with the use of the default identity, the need may arise for preventing users who are supposed to use the default credentials in JChem Server for their database operations from accidently using their parent session identities. The allowed.to.specify.credentials property in jchem/cartridge/conf/jcart.properties can be set for a comma separated list for this purpose. When it is specified, only users whose database login names appear in the list are allowed to set their parent sessions' identities for use in the JChem Server. 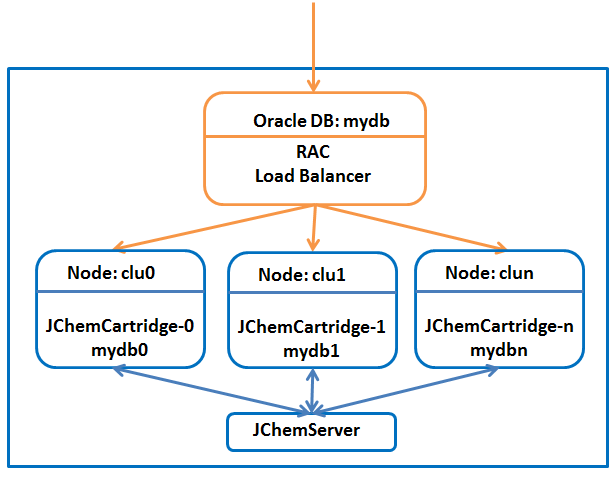 Please, note that the JChem Cartridge components which are executed in Oracle currently communicate with JChem Server using an open RMI protocol. This means that some kind of protection (e.g. a simple firewall) must be setup on the machine which hosts JChem Server to prevent unauthorized searches in the structure table. In addition, if users are also to create jc_idxtype indices from within PL/SQL programs, they will need to have CREATE TABLE and CREATE SEQUENCE privileges directly granted to them. (Privileges associated with RESOURCE role will be ignored as well.) Symetrically, users will need DROP TABLE and DROP SEQUENCE privileges directly granted to them in order to successfully drop indices in their schemata. Depending on how JChem Server is set up to connect back to Oracle, this step can be as simple as granting the appropriate privilege (the required combination of SELECT, INSERT, UPDATE and DELETE privileges) on the structure table to the non-owner user. With this configuration, the appropriate privilege (the required combination of SELECT, INSERT, UPDATE and DELETE privileges) must be granted on the structure table to the non-owner user. "search" flag, 1 if the user needs to access the index for searching, 0 otherwise. "insert" flag, 1 if the user needs to access the index for inserting new structures, 0 otherwise. "update" flag, 1 if the user needs to access the index for updating structures, 0 otherwise. "delete" flag, 1 if the user needs to access the index for deleting structures, 0 otherwise. Note: You may need to use a fresh database session for all the newly granted privileges to take effect. Depending on which tool you use to execute structure searches, this may involve restarting IJC or SQL*Plus – or even restarting the JChem Cartridge server, in case the user already did unsuccessful searches with an incomplete privilege set. Also, rarely, you may need to commit (or close) the SQL sessions used to grant the privileges. If multiple users need to use the same index with the same access privileges, you may want to create a role for the particular privilege set on the particular index and execute the above steps on the role (instead of concrete users) and grant the role to the users. UTIL_MB giving the value for the memory resource in megabytes. Total JVM memory: the amount of memory currently reserved by the JChem Server process. Free JVM memory: the amount of memory currently reserved but not allocated to Java program objects. Max JVM memory: the total amount of memory which the JChem Server process is allowed to eventually reserve. <index-owner-name>.<index-name>: the amount of memory used for caching data associated with the specified index. When executed by the JChem Cartridge Owner, jcf.t_get_taskinfo() returns all outstanding tasks. When executed by non-JChem Cartridge Owners the function lists only the tasks which they have started. Currently only index scans are tracked by the jcf.t_get_taskinfo() function. Tasks started to create or rebuild indexes can also be tracked via the v$session_longops table. To do this, the chemaxon.jchem.cartridge.indexingIsAynch has to be set to true in the jchem/cartridge/conf/jcart.properties file. See the refreshPeriod index parameter for more information. Creating index: opname field begins with "Creating index "
Rebuilding index: opname field begins with "Rebuilding index "
assign an operation ID to the searches unique in the current session. identify the task in the task list by the JCC session id and the operation ID. Only search tasks started for domain index scans are covered. Searches started as part of search filters are not accounted for as tasks. This command works only randomly on Oracle RAC configurations with multiple JChem Servers because of the randomness of the Load Balancer. will dump the current execution stack of the JCC server's threads to the standard error. Activity of the JChem Server and Oracle side processes can be logged by configuring the logging.properties file which is available in the <installed JChem's home directory>/cartridge/conf/ folder. The log files, by default, will be generated in the <installed JChem's home directory>/cartridge/logs/ folder. Log files starting with jcart refer to the activity of the JChem Server, while log files starting with trace refer to the Oracle side processes. SQL operators of the Cartridge can be used to search for chemical data. SQL procedures are also defined to perform DML operations on chemical tables. To increase the speed of the searching process, the jc_idxtype index type has to be applied. drop all jc_idxtype indexes and other PL/SQL objects that have been created after installation (including user defined operators added in support of user defined functions and supporting PL/SQL functions). The following upgrade instructions apply to JChem Cartridge version 5.0 or later. See our FAQ comment regarding JChem Cartridge upgrade test. Set the JAVA_HOME environment variable to the home directory of a Oracle Java Development Kit version 1.6 or newer. Download the installation package of the new JChem Cartridge version. Typcially, you may want to unpack the new version next to the location where the old version was unpacked (i.e. in a sibling directory of the old version). Starting with JChem Cartridge version 5.5.1, the staging schema will be emptied by the upgrade program after it is no longer needed, so it is ready for use during subsequent upgrades. With prior versions the schema can be emptied by executing the script published under this forum post. Restrict access to the Oracle instance and/or to the applications accessing the JChem Cartridge so you can safely upgrade the JChem Cartridge without user requests and the installation procedure interfering with each other. Execute server.sh stop (or server.bat stop) in the cartridge directory of old JChem version The second step must be performed even if the service appeared to stop correctly in the first step. When prompted for the DBA login, enter an exclamation mark (! ), if you don't want the installer program to use DBA account. See this pre-upgrade task for steps required before installation in such cases. As the last part of this step, Windows user will be offered the option to upgrade the JChem Cartridge windows service. Select this option only if the windows service was created by the JChem Cartridge installer during the original installation. On Windows, the upgrade application will offer to upgrade the Windows service for JChem Cartridge server. On other operating systems, you must make sure to update the service configuration to point to the new JChem package. upgrade JChem structure tables (if you use any) using JChemManager. Execute the same steps as for JChem Servers without RAC. On the first node execute the same steps as for JChem Servers without RAC. On all the other nodes follow the steps described for JChem Servers without RAC but instead of starting the script upgrade.sh (or upgrade.bat on Windows) without any parameter as described in the 4th step in the Upgrade section, add the --jcserver-only parameter.